The layout is based on Canadian National in Nova Scotia in 1978. I am modelling A small portion of the Hopewell Subdivision and Oxford Subdivision as well as the Pictou Landing Branch. The Hopewell Subdivision goes from Truro to Havre Boucher. The Sydney Subdivision is the second part of this line and goes from Havre Boucher to Sydney. This was an active secondary mainline. The Oxford Subdivision went from Stellarton to Oxford Junction on the Springhill Subdivision with major customers at Granton, Abercrombie and Pugwash. The layout is based in Stellarton, which was division point and yard for CN as well the beginning of the Oxford Subdivision. In addition to Stellarton, portions of New Glasgow, Trenton, Pictou Landing, Granton, and Abercrombie will be modelled as well as a portion of the line to Truro. CN sold the Hopewell Subdivision and Sydney Subdivision to RailTex in October of 1993. 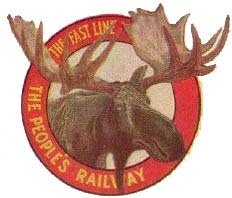 It became known as the Cape Breton and Central Nova Scotia Railway. Major traffic sources in 1978 were coal from Sydney and some smaller operations around Stellarton, steel traffic to and from the Sydney Steel mill, a gypsum mine, two pulp and paper mills, a Michelin Tire Plant, Trenton Car Works (rail car manufacturer) and two power generating stations. Please see the link to the left entitled Industries on the Layout for more information about the industries I am including. VIA Rail Canada was founded in 1977 and inherited most of the passenger equipment and motive power from Canadian Pacific and CN. It was quite common to see a mix of liveries in 1978 as VIA slowly painted all their rolling stock and motive power in their gold and blue colours. The Hopewell and Sydney Subdivisions saw two passenger trains a day in each direction, one of them being 2-4 car Rail Diesel Cars and a 5-8 car normal passenger train with a typical consist of 2 RS-18's, a steam generating unit, a baggage car, sometimes a baggage express car, regular coaches, day nighter coaches, one sleeper and a cafe lounge car. The Pictou Landing branch was abandoned in 1955, but I am using my modelling license to keep it in and using the harbour and pier to ship and receive from. Scott Paper actually shipped out of Pictou, so it will not be much of a stretch to be shipping kraft pulp out of Pictou Landing. This part of my layout is still being designed. When the line was in use it was primarily to take Pictou County coal to ships. There were at least two coal piers at Pictou Landing. A doodlebug also operated taking workers into town. I will be trying re-create an appropriate use for CN traffic in 1978.